Freshersworld.com Platform for Online advertisement and Campus Recruitment. Your online branding partner who would help you in your admission assistance with our traffic and receptive registered candidates that we engage with. A Placement Facilitator for all placement challenges for your candidates through Premium Association. Engage with the audience and educate them on your training programs. Also access to registered database through the online packages. We have end to end solution for all your challenges. The credibility of your college recruitment is directly proportionate to the Placement Opportunities that we provide to your students which in turn increases your admission rate. In such a scenario, it is important for you to associate with a partner like us for all your placement needs. Now you can get connected to over 5000+ corporates by making us your Placement Partner. Freshersworld.com, India's No.1 Job portal for freshers, with over 1.5+ Crore freshers resume and 25 million+ unique visitors every month. 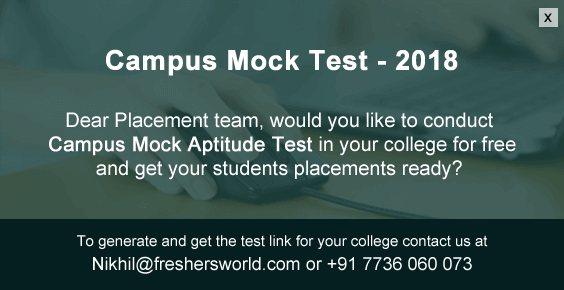 We, as a placement partner work closely with colleges and corporates to help in campus recruitment, admission assistance ,Online placements Training for students to achieve their short and long term goals, and plays a vital role in connecting colleges with potential recruiters to get more visibility through off/online campus recruitment activities. Freshersworld also provide registered candidates from our database to generate leads for training institution, and we offers branding and advertisement services through Banner Campaign, Mailers campaign, SMS alerts and Social media campaigns to reach out the right audience. Post your job and get 100 Hot profiles instantly. RPE technology to extract best matching profiles. get access to highly active candidates in the mentioned job criteria. 70% unique data compared to all other major job portals. Fresh database Guarantee- We get more than 3 Lakh+ registrations on a monthly basis. Sort according to colleges, Branch, Year of passing, Percentage, etc. Hyper-local candidate search- Search candidates near your location. Job Role and communication skills based search. Interview call letter feature with confirmation tracking. SMS/Mail/App push notification (Get Instant responses from candidates).